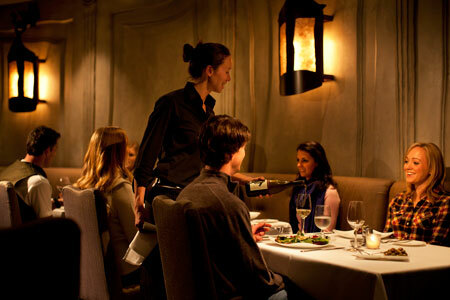 This offshoot of the San Francisco location features fresh California cuisine and one of the best wine lists in Tahoe. : Gavin Newsom, San Francisco’s rangy, handsome former mayor and California's current lieutenant governor, is the founder of the PlumpJack Group, so it’s no surprise a city crowd frequents His Honor’s place in the mountains: lithe, pedicured brides in summer, Squaw Valley skiers in winter. They nosh on seasoned ahi served in pastry cones, a PlumpJack signature dish that works. Soups succeed, too, including a kabocha squash winter bisque to warm the soul. The kitchen builds the menu with sustainably raised ingredients such as Fulton Valley chicken and Meyer Ranch beef. Seared diver scallops are served with bone marrow and fried ginger and a garlic-scallion vinaigrette. The dessert menu features delectable twists on classic treats as with the chocolate mousse s'more, Mandarin dreamsicle and chocolate-peanut butter candy bar. Comprehensive, fairly priced wine lists helped make PlumpJack’s name in San Francisco, and that’s also true here. The Cafe’s list encompasses the world’s major and emerging wine regions, and choices aren’t included simply for marquee value. Share a bottle amid the dining room’s slate and cool green tones.